The winner of the 2001 Eisner Award for Best New Graphic Album. Sacco spent five months in Bosnia in 1996, immersing himself in the human side of life during wartime, researching stories that are rarely found in conventional news coverage, emerging with this astonishing first-person account. 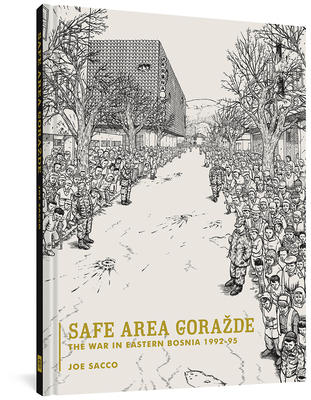 Praised by The New York Times, Brill's Content and Publishers Weekly, Safe Area Gorazde is the long-awaited and highly sought after 240-page look at war in the former Yugoslavia. Sacco (the critically-acclaimed author of Palestine) spent five months in Bosnia in 1996, immersing himself in the human side of life during wartime, researching stories that are rarely found in conventional news coverage. The book focuses on the Muslim-held enclave of Gorazde, which was besieged by Bosnian Serbs during the war. Sacco lived for a month in Gorazde, entering before the Muslims trapped inside had access to the outside world, electricity or running water. Safe Area Gorazde is Sacco's magnum opus and with it he is poised too become one of America's most noted journalists. The book features an introduction by Christopher Hitchens, political columnist for The Nation and Vanity Fair.